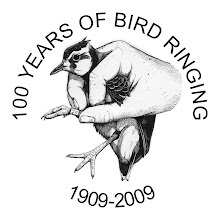 We recently heard of an amazing day's ringing by John Black in Kent. With a break in the weather, John headed out to continue his work fitting geolocators to Nightingales as part of a larger BTO project. These loggers use daylight sensors to determine the location of the bird, with the data being downloaded the next year when the bird is recaught. The day started well, with John catching nine birds, bringing the spring total to an impressive 69 birds ringed. There was also a nice surprise on closing the nets when a fine male Lesser Spotted Woodpecker was caught. But John's attention was also caught by a colour-ringed Garden Warbler in the same net. Having helped out on the BTO/RSPB/GWS Migrants in Africa Project in February this year, John had a strange sense of déjà vu. Taking the bird out the net, the ring confirmed his initial thoughts: GRS ZOOL DP LEGON GHANA P007049. This bird had originally been ringed in Ghana in March 2011. Remarkably, John himself had then been on the team that recaught the bird and added the colour rings, again in Ghana on 10th February 2012, but hadn't processed it himself. There have been just 15 recoveries of BTO-ringed Garden Warblers in sub-Saharan Africa, 14 of which come from Ghana, with the other in Nigeria. This highlights the importance of this area for wintering Garden Warblers and the need for continued research in this part of the world. Thanks to John for letting us know about this incredible morning and we're all ultimately rather jealous!